Now that you hopefully know the key concepts (read here for a refresher) behind Tymly it would be a good idea to put them into use. What better way is there than a Hello World example? Before you begin first make sure you have Node.js installed. Tymly requires at least v8.5.0. To help show what Tymly is about we’ll go through the steps to get ‘Hello World!’ Printed to the console. All functionality in Tymly is delivered via a state machine and state machines are defined inside blueprints. 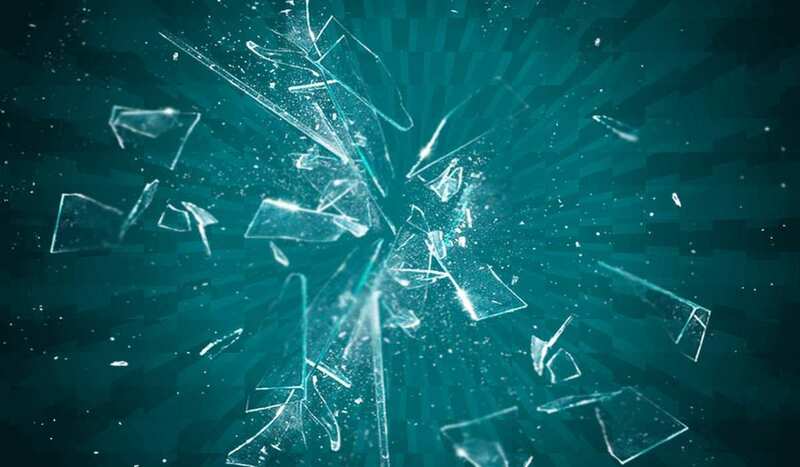 So, to get ‘Hello World!’ onto the screen, we’re going to need ourselves a blueprint. The important takeaway here is that our blueprint is named ‘helloWorld’ and it will live within the ‘tutorial’ namespace. Blueprints which share the same namespace can refer to each other’s components. The rest of the blueprint.json is meta tinsel. This is a relatively exciting moment! 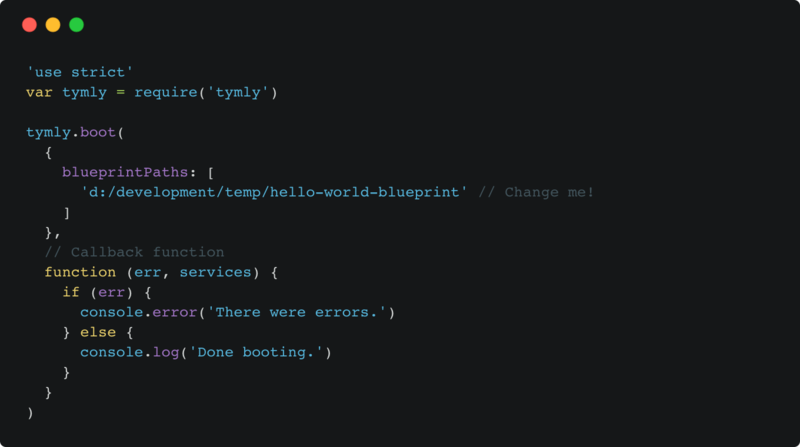 Tymly has booted, consumed the demo blueprint and offered lots of ready-to-use services – the reason we’re not seeing Hello World! yet is that we haven’t used any of those services. Let’s execute a State Machine! 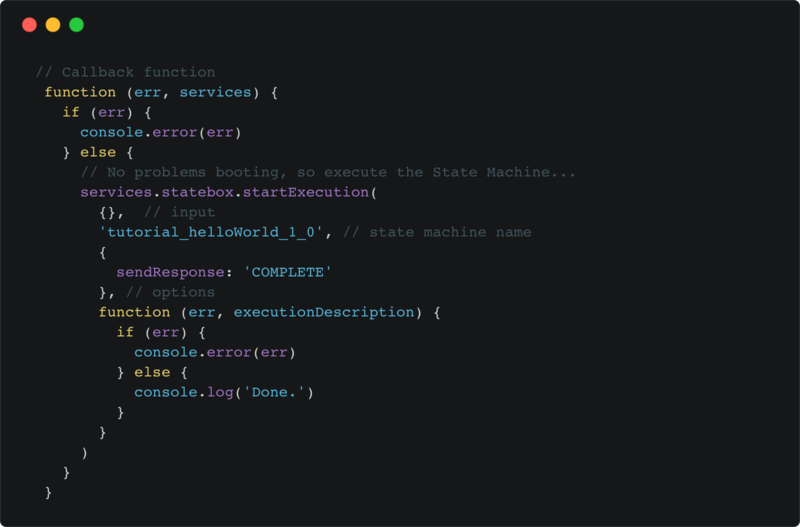 The statebox service offers an API with a few methods including startExecution. The minimum required to call startExecution (as seen in this example) is a state machine name – here we’re using tutorial_helloWorld_1_0. These unique names are conjured by combining the blueprint’s namespace (tutorial), the state machines’s name (helloWorld – which has been inferred from the /state-machines/hello-world.json filename) and the version number of the state machine (as defined in the /state-machines/hello-world.json file). Hooray! You should now see ‘Hello World!’ printed on the console. 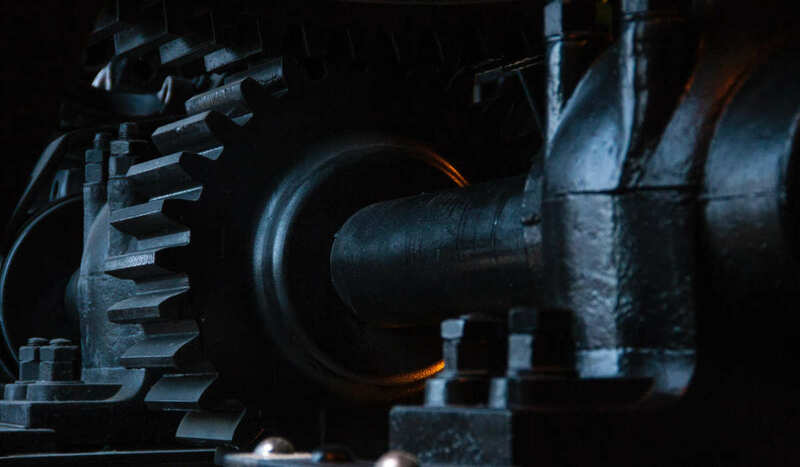 In this first tutorial we’ve used some of the major components of the Tymly framework (blueprints, state machines and services). The good news is that the distance from this point to running more complex state machines only requires the introduction of a few more components.